It’s been a snowy winter in the Midwest, and as I write this in mid-January a storm has dumped 6 to 10 inches here in central Ohio. That gave our subject truck, a Freightliner M2 106 with plowing and salting equipment, its first real workout, says its operator, Brad Young, who works part-time for Bennington Township, in Morrow County, Ohio. The township bought the truck about three months after I drove it last summer, when it was a demonstrator unit at Fyda Freightliner in Columbus. The new Freightliner replaces a 1999 International 4900, and “it’s like driving a Cadillac now,” he said. No wonder: The Freightliner has a gutsy 350-horsepower Detroit diesel and an Allison 6-speed automatic transmission, and it really scoots. Medium-duty trucks with plow mounts and in-cab controls have been staples of municipalities for many years, not just for snow removal but also to haul dirt, sand, gravel, and asphalt to road and utility work sites. This unit—with its chromed bumper, polished aluminum wheels, and bright-metal trim—is fancier than what most municipalities run, but Bennington Township took it that way. It looks as good sitting outside its shop building in Marengo, a village near Interstate 71 northeast of Columbus, as it does working on the township’s 25 miles of roads. Fyda sales representative Jonah Schneider said that he had been showing it to fleet people in Columbus and surrounding suburbs, and they had seemed impressed. Freightliner also offers a slightly longer 108SD that’s designed for severe duty, but the M2 has a tighter turning radius that’s handy in confined urban spaces, he said. And this one has a beefed-up frame and other equipment designed to stand up to vibration and shock that comes from snow plowing and materials hauling. Henderson Equipment’s facility in Bucyrus, Ohio, upfitted the truck with plowing and sanding equipment and a stainless-steel dump bed, along with special lighting. Freightliner entered the medium-duty business in the early 1990s and, thanks to sound engineering, attractive features, and aggressive marketing, has built sales to where it now dominates the midrange segment as it does heavy-duty segments. This particular truck’s axles and suspension capacities together exceed the 33,001-pound Class 8 threshold by 4,499 pounds. Yet its sprightly performance gave it the feel of something much lighter, and not just because its dump box carried no load. In short, it was a kick to drive. This was on streets and freeways on the south side of Columbus, near the dealership that’s visible from Interstate 70. The Detroit DD8, a relatively new 7.7-liter inline-6, has the top rating of 350 horsepower and 1,050 lb.-ft.
Freightliner packages exhaust aftertreatment, including catalyst, DEF dosing chamber, and diesel particulate filter, behind the passenger steps. Folks in the business call this a Baby 8 or heavy 7 because it’s technically a heavy truck with a midrange powertrain, in this case the new 7.7-liter Detroit DD8 diesel and an Allison 3000 RDS (for Rugged Duty Series) automatic transmission. The Detroit was pleasingly gutsy and the 6-speed Allison shifted just right. That, coupled with the exceptionally tight turning radius, allowed me to easily keep up with traffic and whip the vehicle around like it was a pickup. Outward visibility was very good, with a large one-piece windshield overlooking a nicely sloped hood; immediately ahead were plow lights, and beyond lay the pavement that we traversed as we dashed around town. A heavy steel plow blade, which the township obtained after it took delivery in November, explains the need for a hefty front axle—in this case a Detroit-made 14,700-pounder—and an 8- to 10-ton load of salt and “ice grits” in the bed would justify the strong rear axle, also a Detroit, rated at 23,000 pounds. As with other truck builders, Freightliner has gone big into vertical integration because it captures more of a truck’s total sales revenue as well as the service and parts business that follows throughout a truck’s life. Detroit-brand axles are made at the same facility that builds Detroit diesels. That plant, like the truck builder itself, is owned by Daimler Trucks North America. 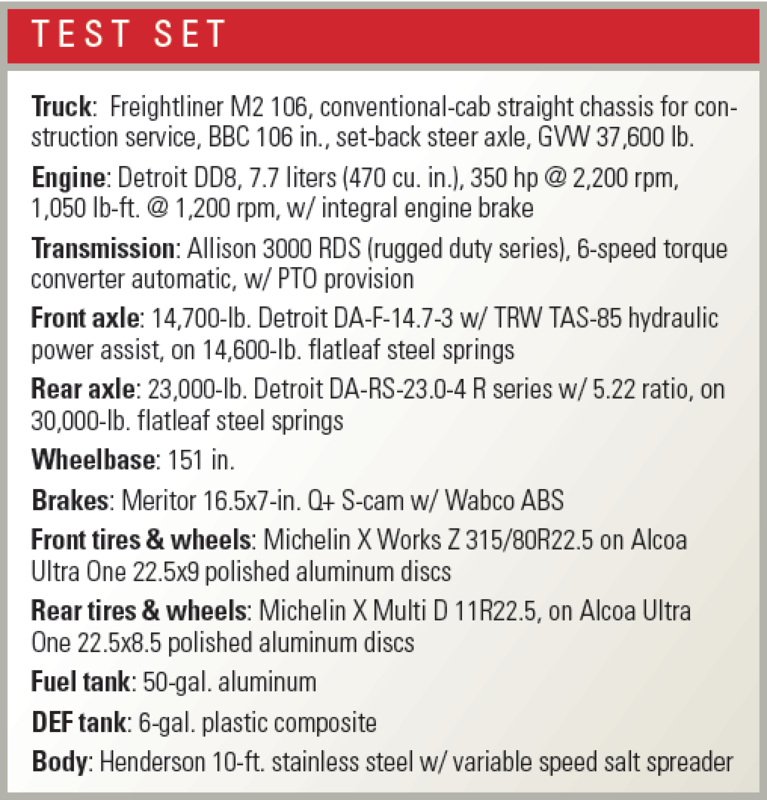 Freightliner still offers vendor components, including Cummins diesels and Meritor axles for customers who prefer them, but of course the load and probably the hired driver don’t care where the components come from as long as they work well and are long-lived. Warranties imply how long an engine should last, and the DD8 is protected for three years or 250,000 miles, including 100 percent parts and labor. Detroit says its B10 life is 400,000 miles, meaning 90 percent of all DD8s should still be running without many repairs at that point. Among the maintenance items are oil changes at 45,000 miles (longer for less severe duties than what this truck will see), valve-lash adjustments at 90,000 miles, and diesel particulate filter servicing at 150,000 miles. Stop-and-go operations will require more DPF regenerations, where the filter heats up to burn off accumulated ash; a warning light will tell the driver if a regen is needed (and he might also feel some sluggishness), and a switch on the dashboard will activate it. Young said he drove heavy road tractors at Shelly Construction and is familiar with regens and diesel exhaust fluid required for modern diesels. The upside is no diesel smoke or smell. Maintenance by the mile won’t be of much concern for Bennington Township because it’s a low-mileage operation. Young said that ’99 International had accumulated only 27,000 miles in 20 years of work, “all plowing snow and patching pot holes.” So it’s likely that the Freightliner will run that long and more. At that point, Young, now 52, might or might not still be driving it, but if he is, he’ll probably still enjoy it.